Local children's performer Sylvia Chave is offering a three-concert series for young children during the 2010-2011 season at The Refinery. Each Singing with Sylvia show, presented around Halloween, Christmas and February break, will feature interactive songs, action rhymes, and quirky characters to engage children ages 2 to 6. The first performance in the series -- the Halloween Howl --takes place on Friday, Oct. 29 at 10 a.m. In this 45-minute show, Sylvia celebrates her favourite time of the year as the "Queen of Halloween" with eclectic costumes and hilarious antics. Sylvia encourages children to wear their own costumes, sing loud, laugh hard and enjoy a trick or two. The second show of the series, Singing with Sylvia’s Christmas Concert, takes place on Friday, Dec. 17 at 10 a.m. Sylvia is cooking up some special goodies to share in this festive celebration of the season. Her last show takes place during February break, on Friday, Feb. 25, also at 10 a.m. Sylvia will sing away the winter blues and have the whole family glowing as she celebrates winter in the most unusual ways. To celebrate the first concert of the series, Sylvia is giving pairs of Halloween Howl tickets to four lucky saskmom.com followers! You may enter this give-away twice. To enter, share your first name and what you and/or your kids are planning to be for Halloween. 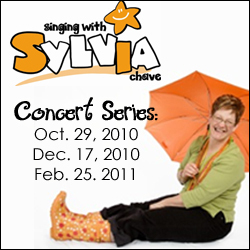 Earn a second entry by joining the Singing with Sylvia group on Facebook and letting us know below. Entries will close at noon on Oct. 25. At that time, four winners will be selected through Random.org. Click on the link below to enter. These are all such cute costume ideas! Thanks for sharing!